Looking at that image you can probably spot three different cloud types quite easily. 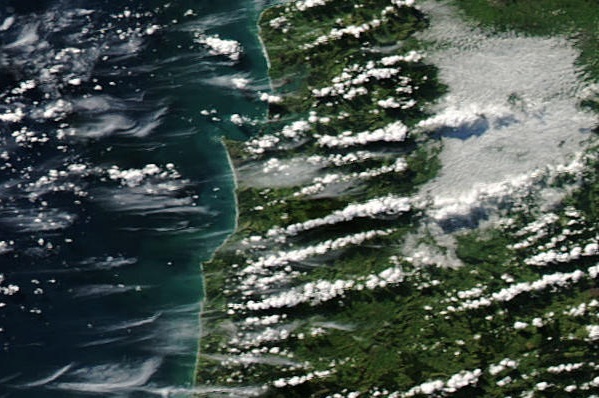 The broad, flat-looking cloud near the top right of the image is an area of fog sitting on the ground. Above this, and casting shadows on the fog layer, are lines or "streets" of puffy looking cumulus cloud. Higher still are thin wisps of cirrus both over the sea and extending onto the land, some of which you can see through to the cumulus and coastline below. Clouds form when rising air cools and reaches its saturation point, causing the moisture in the air to condense into water drops. 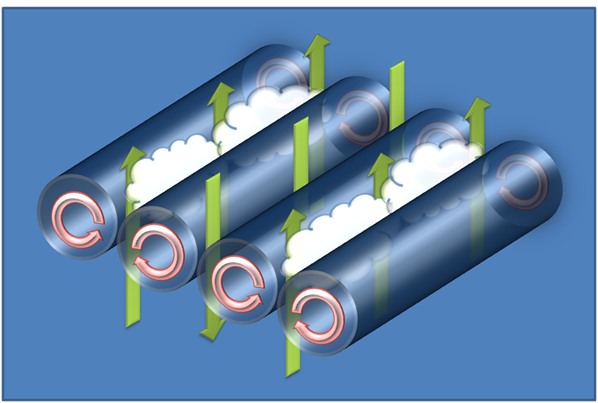 Here we see lines of rising air or updrafts between counter-rotating tubes or rolls of air that are aligned with the flow. In between the updrafts are lines of sinking air in which cloud can't form. The result is narrow lines of cloud, separated by narrow lines of cloud-free air. Note that this is quite a different process to lines of cloud that are often observed downstream and parallel to a mountain range and perpendicular to the wind flow. Written by Chris Noble in 2010. Last updated: April 27th 2016 by Lisa Murray.